This is one of those fun activities that's quick, easy, and soooo open ended. 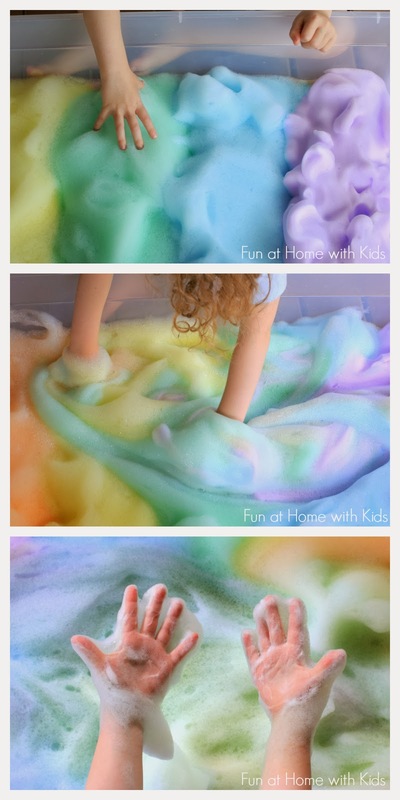 It took me around 10 minutes total to whip up this huge batch of bubbly, puffy, rainbow soap foam fun. We've played with soap foam before, but just plain white bubbles so our baby could play too. I decided it was time to add some color and feel the rainbow. 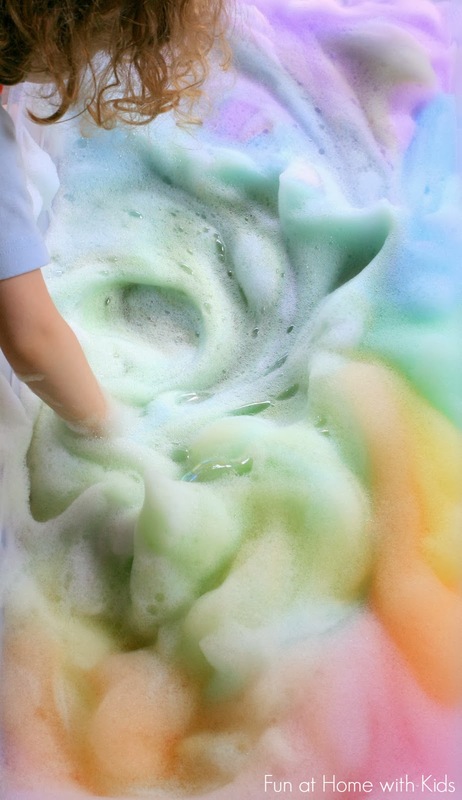 And since S is such a fan of bubbles, I decided to fill our entire sensory bin with the rainbow soap foam! Don't you just want to dive right in? You could make just two primary colors and make it into a color mixing lesson. You could make it just a sensory activity by itself. Or you could add some cars, as S did, and transform it into a rainbow car wash. However you work it, there's something that's just so much fun about swirling a huge bunch of soap foam. S worked the sensory angle by swirling and mixing. She made foam mountains and crushed them. She washed six cars exceedingly well. In a bowl, add 2 Tbsp of dish soap and 1/4 cup of water. Add food coloring or Colorations Liquid Watercolors (we used Liquid Watercolors here) to the mix if desired. Mix on the highest possible setting for 1-2 minutes. Your foam should be able to form stiff peaks that hold their shape. Scoop it out into your container and repeat as necessary until you have the desired amount of foam! 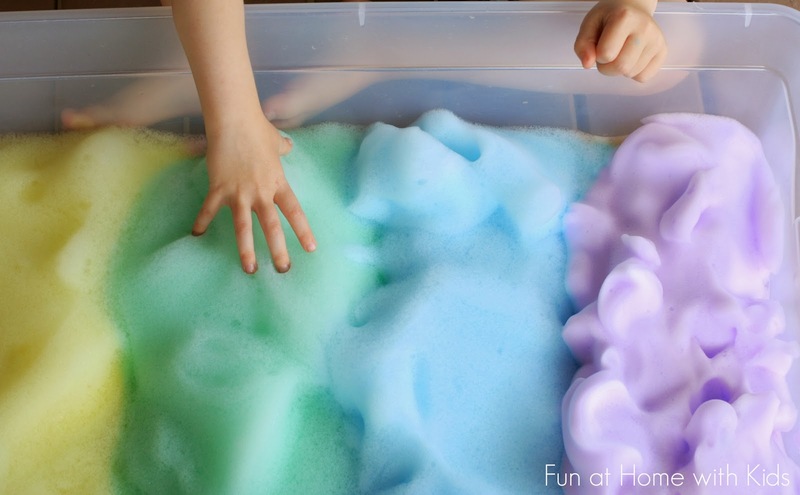 I do not recommend this activity for very young children who may put the soap in their mouths or eyes. The soap is not meant to be ingested and will sting if rubbed into eyes. This is so cute! I'm going to try this. Thanks, Shailynn!!! :) Hope you all have fun with it! where do u get ur watercolors? If you click on either of the "liquid watercolor" links above they will take you to online listings. We've bought ours from Discount School Supply and also from Amazon. Hope that helps! I am going to try this activity as well Shailynn! Asia thanks so much for sharing! I will be starting my very first self- contained ASD class in January. Looking for great lessons and activities to keep students engaged. Asia is it okay to create foam with my students or have it prepped and or prepared before hand? We are totally trying this, like, tomorrow! I know the twins will love it! Tried this today. My 5 & 2 year olds loved it. But I used our usual baby wash instead of dish detergent. I think it resulted in less stiff bubbles, but it still worked OK. The girls have sensitive skin and, well, you know, toddlers with their EATING stuff and getting it in their EYES. LOL! Thanks for the idea, it was a hit. Aww, I wish I had read the comments ahead of time. We tried with Dawn and I didn't even think about soap + eyes. He rubbed his face and got it in there and then it became quite a scene of crying and eye rubbing (with soapy hands) that ended with me sitting fully clothed in a bathtub holding him. We will try again with some no-tears bubble bath because the foam was fun. Hello! Do you think the bubbles would hold up through 4 15 minute sensor rotations for some eager Kindergartners? @Asia Citro, I like how you reply when someone adds a comment! I'm a kid, and I really want to play in that if my parents say "yes". Can you add a reply to this comment? P.S. I am only 7 1/2. (My brithday is on November, and right now, it's October! YAY! SO CLOSE! love all the foaming colors! Thank you, Jaime! It was soooo beautiful! I am such a sucker for an activity that involves gorgeous colours and you have sucked me right in!! Love this! So beautiful! So fun looking! Can't wait to try with my son. I would love for you to link it up to my sensory play party today if you have a moment! What else can u use if you don't have dye you mentioned? Koolaid packages would work as well but note they will stain and don't wash out !!!! We tried those and found that they made the bubbles super sticky - did you find that they were overly sticky when you tried it as well? Ohhhhh! I've had this activity on our to-do list for a while now! You've made it look soooo amazing and inviting, Asia! We will definitely do this when the Hooligans return in the Fall! Thanks for sharing with us today! Looks amazing! I think I missed it but are you mixing with a hand mixer? I didn't have a bin as large as yours but I filled two plastic shoe boxes with two colours each and my kids had a blast! Made for some great pictures. When they were finished my oldest daughter asked when we could do it again. Thank you! How long do the bubbles last? Have an event going on and would like to try this. I would have to transport this though. Hmmm, I don't know that I would trust them to transport well. I'd worry that the vibrations of the car would cause them to deflate. If you were to try, I would have a backup in case they don't make it. Is there any way you could bring the supplies and a hand beater to the site? Trying this with my granddaughter tonight. So excited, she is going to love it!! Oh yay!!!! I just know she is going to have lots of rainbowy soapy fun!!! Can you use tear-free baby wash? Did the tear-free baby wash work well? I'm so curious! This was a huge hit here today! my 4 and 5 year old (both home sick) absolutely loved this and it killed a whole hour from the start of the process (which they wanted to help with and loved) to the end result of a soupy mess that took all of five minutes to clean up. VERY fun :) thanks for sharing!!! So I don't have kids and I don't babysit or anything but I really want to make this... for myself... to play in. Plus there's some awesome photo potential here! Your pictures are gorgeous! Well we did this, it didn't last very long. Baby really enjoyed it, but it all dissolved away within 15 minutes, felt like a waste of dish soap. We did a large bin took quite a lot. If I were to do it again I would just use regular bubble bath to make the bubbles, I think it would have more staying power. Or just give him an actual bubble bath and put colors in it. I bet it is the difference between dawn 'original' and dawn 'ultra'. I think what they call original is a watered down version. It takes about 3x the amount to wash dishes. Can they bathe in this? I mean is it safe enough? Loved your post, your pics and details for the recipe. Will definitely try this at home with my little one!! Ohhh, I love that idea! We have never played with piping bags before - now I really want to! That's so sweet - what a delightful bake shop they must have had! So glad they loved it and thanks for the idea to use piping bags!!!! Tried this with my 4yo brother today. We used some weird "green" dishwashing liquid that didn't last very long (in bubble form) but he loved it! Oh bummers about it not lasting long, but awesome that he loved it! Did it just not foam well? I wonder if it needed more time in the mixer? It's so funny to me how different soaps are!!!! Super fun idea. Kids love to play in bubbles. Thank you, Candy CanDo! Bubbles are always fun!!!! I am definitely doing this for my 18th birthday tomorrow! If you're passionate about something, do it! Age is no restriction! Hahahaha - that's awesome Stephanie! Happy birthday! This cured our cabin fever in a big way, thank you! My 3 year old spent hours with it. He loves to cook, so his favorite part was actually mixing each batch. It can use up a lot of soap, and his sensitive skin was very itchy after playing in it in the tub, but it is fun, cheap, easy and so versatile. He tied it in to a book we got from the library, Monsters Love Colors, where the monsters squish colors to mix them. Oh I'm so glad he loved it! Boo about the sensitive skin - I suspect though even if you used a gentler soap, it would still dry his skin out. What a clever little guy - I love it!!!! Boo. I'm so sorry, Ryan! :( I have heard that food blenders also aren't as reliable as the stand mixers or hand mixers. Does the food coloring dye the tub? We didn't use food coloring here, but we have with other activities and have never had trouble with staining. Hope that helps! Dif this with food dye. Kids loved it! I have a 5 & 2 year old. It was hard to get them to keep it in the bucket & dyed spots on my floor, their skin, & tracked it on my carpet has well. But had a blast & its expected to get stains when you have kids. My son's and my hands are stained with green food coloring and I'm not happy about this. It looked good and my son was delighted to see the results, but I won't be doing this again. Sorry, but some of us do get bothered by stains. I'm busy enough as it is and now have to spend extra time scrubbing out stains. I'm sorry! This is why we recommend using liquid watercolors - they are washable. So sorry about the stains!!!! she did warn in the post about potential staining when using food coloring. That sounds so awesome, Denise!!! I love it! Did this today and my children 5 and 2 had a ball. Love, love this! I'd have never thought to whip up bubbles in the mixer. Pinned and sharing in an upcoming bubbles roundup. So fun! My kids will love it. Is this safe to bathe in? That's up to you. It's dish soap - so it could dry out or irritate skin. An alternative would be to substitute whatever body wash or bubble bath you'd normally use for the dish soap in the recipe above. Hope that helps! Oh noooo. I am so sorry!!! What a huge bummer. I have never tried it with a blender - I suspect that part of the problem was that it was having trouble getting enough air to make some nice foam. :( I hope you will give it a try again with the hand mixer. Our recipe definitely works with one - I've tried it tons of times and thousands of readers have sent photos, so you should be good! My 2.5yo thought this was the greatest activity in the world! We used our regular plant-based dish soap (Trader Joe's Lavender Scent) as well as some Dawn, and the plant-based one turned out denser and it lasted longer. It took more batches to get the same volume though (it was maybe half as voluminous, but also that much denser). This kept her occupied for about an hour and a half in a dry bathtub before we turned on the water to wash her and everything else down. I used 2 drops of food coloring in each batch and didn't get any staining on her or the tile grout. She was naked, so no idea if it would have stained clothing. Oooh, good to know! We have a Trader Joe's in town - we'll have to give it a try! Also glad to hear that light food coloring didn't produce staining - phew! Super fun on a snow day where the snow didn't hang around long enough for us to get out and play! Kept my 4 year old and 21 month old boys busy (and not fighting) for about 45 minutes. Now they're cuddled up having snack and watching a show together. Thanks for the great activity! Can't wait to use it in 5 years..? Not if you use liquid watercolors. If you are allergic to the soap you use, I suppose it could be. Hi, we have a community fair where I live, and we do a massive foam slide, and it would be soooo much better with rainbow. But I'm wondering how much of this washable watercolor I need to buy and if it's even plausible. So my question is; how much of the water color did you add to make your rainbow? Is it the size of a regular bouncy house? It only takes a squirt (maybe a teaspoon) to color the amount I talk about making above. I think that a bottle would be fine for each color if it was the size of a bouncy house slide. That sounds like such a fun event!!! (cant tell if my comment saved!) my kids loved this today. next time, i do it in the bathtub while i mix more nearby to pour in! how did you get a yellow color using dawn? mine came out green since the dawn is blue! Awesome!!! And hahaha an impromptu lesson in color mixing! Our Dawn is clear, so I didn't have any troubles. I'm pretty sure there's a Dawn version in just about every color it seems - there are like two rows of different types of it at our local grocery store. Hope that helps! I don't have nor work with kids... but I am very much tempted to make a bubble bath out of this (with a bath bomb thrown in, maybe). That sounds like a very positive night to me. I am confused about the instructions. Is it 2 tbsp of water with 1/4 dawn, or 2 tbsp dawn with 1/4 cup water??? Unless my eyes are playing tricks on me, both recipes are listed in your blog. Thanks for a super fun idea. I'm going to try it with my grandson tomorrow. Put the kids in swim suits and let them foam paint your garage door (if it's white). Mine didn't just finger paint, they body painted. Yes, but try to make it quickly. It will deflate over time. So we did this today with food coloring...my 3 year old had a blast with it all. We of course needed it in the bath as well. Just an FYI ifor using blue or green don't be worried if the bath water changes color when the foam gets mixed in. It didn't stain him or the tub. But it did tint his blonde hair a little lol. My son does not have form of austim as the website that was shared with me says its a great sensory idea, however, we have made these the day I got the email (6/30/2016) and my son LOVED them. We made blue and yellow and he was playing with blue bubbles as I mixed the yellow. I did take them outside as they are kinda messy but what 5 year old or any kid doesn't love making a mess? We had just a small severing bowl and he sat in it with several hot wheel cars playing in them. Once he was done and got rinsed off he asked me that once I get him something bigger to hold more in (the author it looked like used a big storage bin for the sensory bin) if we could do more. I have shared this idea with other parents to do with their kids/grandkids/nieces and nephews and shared a video of my son playing with them and they all said its quick and easy to do on a day off or when the kids are bored. Thank you sooooooo much for all of the ideas you have posted as there are several I want to do with my son. I'm not sure! We've never had that problem. Maybe try mixing the color into your soap directly before you add the soap to the water? I love this recipe. I work at a daycare center and have used Johnson's Baby Wash instead of Dawn for my one year olds. No hurt eyes! Looks like so much fun! We'll try it for Freddy's birthday party coming up soon! Thank you! That would be a blast!! !